Home Security Month Week 2 – Lock it up! National home security month is now fully under way and moves into its second week where we look at door and window locks, first lets start with some security stats! 20% of all burglaries are committed through an unlocked door or window. Most burglaries are not pre planned, but often committed by thieves that notice a door or window open or valuables on display. Let start with window locks, something that is all too often overlooked. All windows should be secured with a key to operate lock, now this could be a simple locking handle as found on most UPVC windows, but older style metal and wooden windows where not fitted as standard with a locking handle. As windows come in many shapes, sizes and styles there are many window locks to choose from, the link below shows the different style of window and which locks best suit them. Other security devices can be fitted to windows, these include window films which make windows harder to smash, window bars either internal or external and ‘shock detectors’ added to an alarm system. 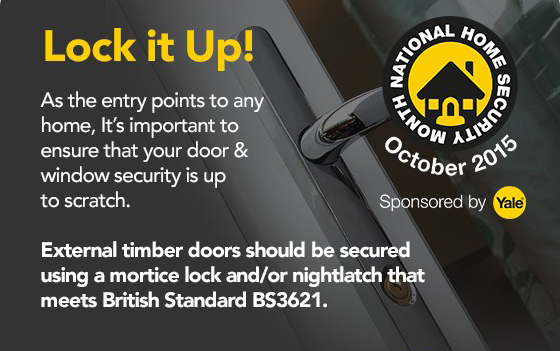 All external door should be fitted with a mortice or nightlatch lock that conforms to British Standard BS3621. Many locks meet this requirement and can be found via the link below, with prices starting at just £11.47 upgrading doors locks does not have to cost the earth. When checking and accessing security levels, it is important to check all external doors including any side, rear or patio doors, these are all possible entry points. Side and rear doors can be further protected with slide bolts that can only be operated from the inside, these are particularly suitable for non final exit doors to increase security.